It’s cold outside, there’s no kind of atmosphere, I’m all alone – more or less (Red Dwarf anyone?). 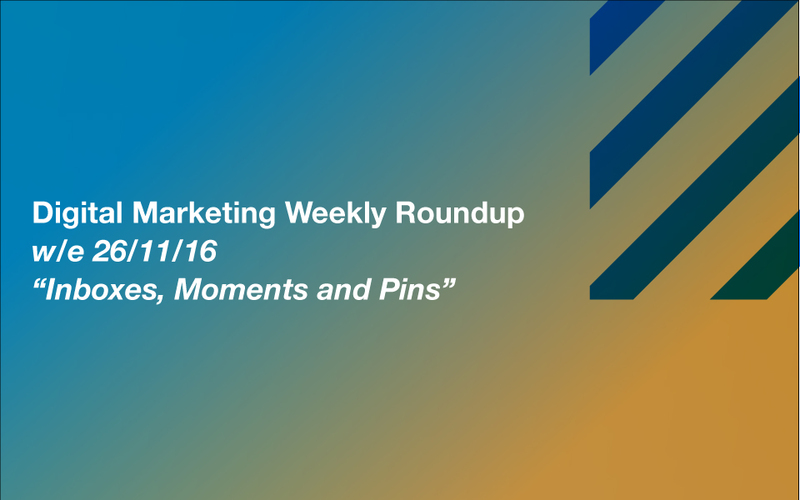 For apart from those goldfish shoals nibbling at my toes, I know I’ve got you brilliant people out there to keep me warm with your undivided attention as I once again deliver Your Digital Marketing Weekly Roundup. And I’m glad, because it’s freeeeeezing!! But, lighting our fires this week is an update to Facebook’s inbox, shareable Moments on Periscope, and some new Native Video Pins on Pinterest. Shall we…? Wouldn’t it be nice, as marketers, if we could have some sort of ultimate digital command centre from where we could “quarterback”, to borrow a US phrase, our whole operation? You know, rather than having to catch the bus to Facebook and engage our audience there, then jump in our cars and drive all the way across town to Instagram to do the same thing, before scrambling our private helicopters to fly us quickly and directly back to Messenger to secure a sale or two. I mean sheesh – what’s a guy gotta do to get an update that combines all three round here? Well, if you didn’t realise you had such a problem, then you can rest assured that it has hereby been solved before it had time to start grinding your gears. Facebook has updated its inbox to include Facebook, Messenger and Instagram all in one neat little package, thusly helping us all reduce our carbon footprints by eliminating all that needless travel between the three. “We’re now making it possible for businesses to link their Facebook, Messenger and Instagram accounts so that they can manage communications across all three channels in a single place. The updated inbox makes it easier than ever to communicate with customers at any time and in any location. Ok, I know I was being a little sarcastic before – but this is actually pretty groovy, isn’t it? Direct communications with customers are perhaps one of the most crucial aspects of the marketer’s daily routine. And this little 3-in-1 combo is going to make those communications – from our mobiles at least – a whole lot easier. Nice one, Facebook. Nice one. Ready for the video marketing lecture? I’ll keep it brief this time – with 86% of all web traffic expected to be made up entirely of video by 2020, as content marketers, we all need to start giving users what they want. Take a look at our recent post ‘How to Nail a Promotional Video: The 10 Bells You Need to Ring’ for some great tips on how to get started with promos. Ok, back to the news at hand. Periscope has now made it possible for users to share specific moments from Periscope.tv broadcasts. Although it’s quite simple, I do like this update. Anything that encourages users to share our video content is a good thing. If, for instance, you’re doing something like a Top 10 video – ‘Top 10 Features of Our New Product’ or what have you – users who want to alert their following to, say, number 5 on the list can now do so without inflicting the whole video on them. Indeed, creators can even do this themselves – i.e. create 10 snippets of the whole video to go out as separate tweets or Facebook posts to act as teasers for the whole broadcast. There are other ways that this little feature could be useful, too. If a customer has a specific question, the answer to which you’ve already given in a longer video, you can now send them the link with a custom start time. Nothing mind-blowing about this update, granted – but it will, if you use it wisely and creatively, enable you to deliver a better service, and that’s what counts. Another little prompt here to get you started with video marketing – Pinterest has just released an update to the Promoted Video feature. It’s essentially an auto-play update. In the past (well, over the past 3 months – Pinterest Promoted Videos are still brand new, really), users had to click on videos to make them play. Now, they start rolling automatically. Furthermore, you can now create video playlists, so that as soon as one video finishes, another starts automatically. It’s worth mentioning that these new auto-play Promoted Videos will appear in Pinterest Explore – which itself is a brand new section of Pinterest that has appeared over the past few days. “Every day, Explore presents picks from top tastemakers, industry experts and even our own Pinterest employees, who crowdsource the best ideas using a combination of what Pinners are loving today and what’s happening in the world around us. “Now Pinners have a daily destination to visit and catch up on the best of Pinterest. By offering your best content in a space tailored to appeal to the Pinners viewing it, your content will be hard to miss, providing a unique opportunity to meet your business goals. I couldn’t have put it better myself, Pinterest – and so I shan’t try. Instead, I’ll just repeat – start testing with Promoted Video today! That’s it – I’m going to go and drink some fresh mango juice and have some fun, fun, fun in the sun, sun, sun if I can find any. See you all next week!